You have no idea how much I am in love with my vintage Wranglers. My love for them has grown tenfold recently after cutting the hems off and making them a tad more cropped. Just in time for spring! My $12 spent at my favorite vintage thrift store in Brooklyn (Fox & Fawn) nearly two years ago really went a long way with this purchase :) I've recently been turning my head back towards raw, 100% cotton denim. When you find a pair that fits like a glove, maybe just a teensy too snug (but in exactly the right places), you know you have a winner. Raw denim molds to you, stretches with you, gives way when you need a breather and just gets better and better with age. It's bringing things back to the 90's, and nothing is better than that right?!? Sometimes too much stretch can feel a little too constricting. It's like every crevice of your body is filled. Raw denim conforms to your curves, but still gives a little room after time. It's the best happy medium. I always like to think of the previous owner of these Wranglers, and I like to think of her as an adventurous babe who always pair them with a Guns N' Roses crop tee and Converse. I'd bring this pair to Puerto Rico with me on Sunday, but I need to throw them in the wash. I think this pair has hit its worn-too-much limit. And yup, I did say Puerto Ricoooooooo. I've been dying to go for years. San Juan in particular. The clear blue Caribbean beaches against classic European architecture have had me dreaming for far too long. It's about time I finally see this all with my own eyes. This trip will be the perfect gateway into spring. Hopefully NYC won't be so cold when I get back. Fingers crossed, but I'm not relying on it. OMG have so much fun in Puerto Rico! I can't say that I've ever owned a pair of jeans that were 100% denim! You make them sound like a dream! Loving this whole ensemble!! Have a great weekend girl!! Rock n'roll outfit! Love your belt and jeans! At my turn I take a look in your I like it. As very soon. Good evenig from Paris. Your coat is really so great! Amazing photos, your style is awesome! Yes so much in love with vintage jean too . Your pics are all so awesome just so obsessed . 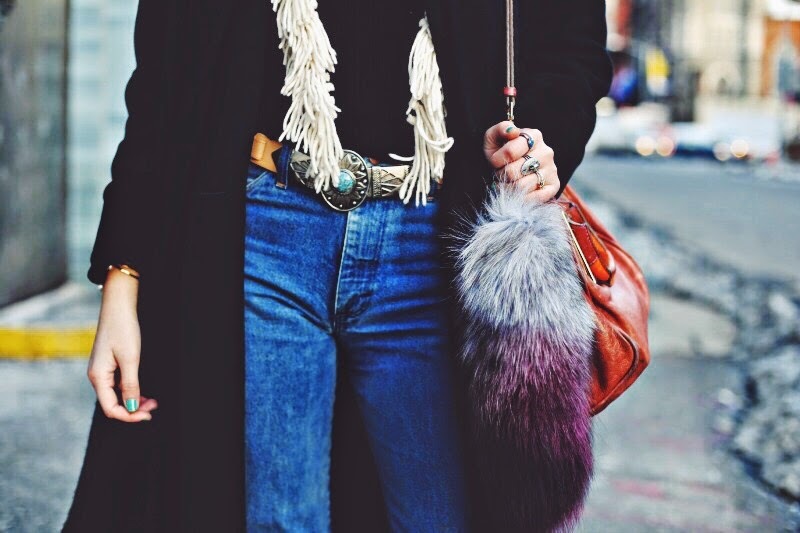 The vivid color of your vintage jeans is awesome! Love the look! The fringing makes a fantastic detail!